How to remove APPX package installed by another user. How to start Lines 3D game in auto-play mode. Lines 3D is a fun logical game with different difficulty levels. While “Beginner” level is an easy to play relaxing game, the “Professional” and “Expert” levels are good exercises for your brain where you can apply your knowledge in the area of the probability theory. There is also some specific “Baby” level for babies, allowing them to move balls and do not worry about the result. 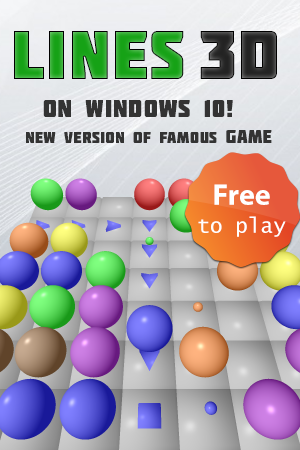 Lines 3D game is a UWP application based on “XAML App for OpenGL ES (Universal Windows)” VS2015 project template (written in C++/VS2015 using OpenGL ES 2.0 and elements of OpenGL 3.0). You can install Lines 3D from Windows Store and play for free, or at least see the game screenshots. Loading sounds from wav files and playing them with different speed and volume. Loading textures from PNG images (this code uses Windows API, but probably it can be made cross-platform). Logging game events, such as “game over” to the Windows Store. They used to collect statistics on what game levels the users play and what score they get. The possible application crashes (unhandled exceptions and memory failures) and internal errors (like file not found, etc.) are also logged to the Windows Store. 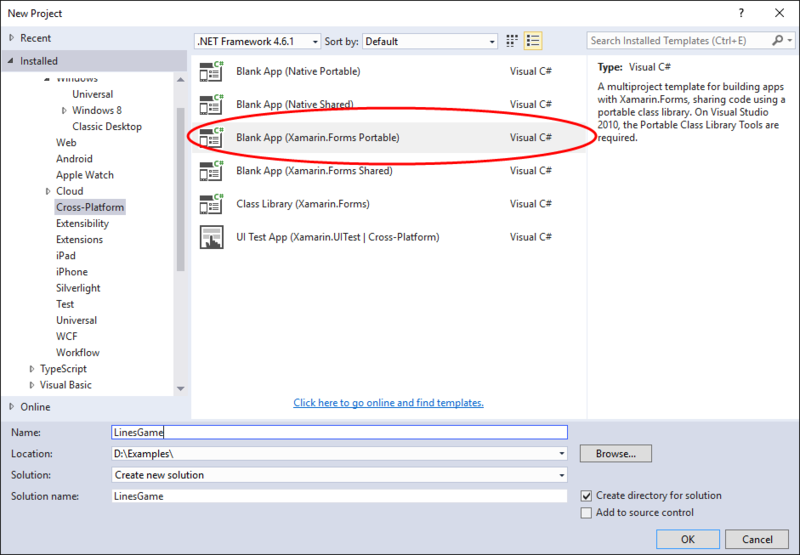 Accessing application installation path and application data path in the file system. 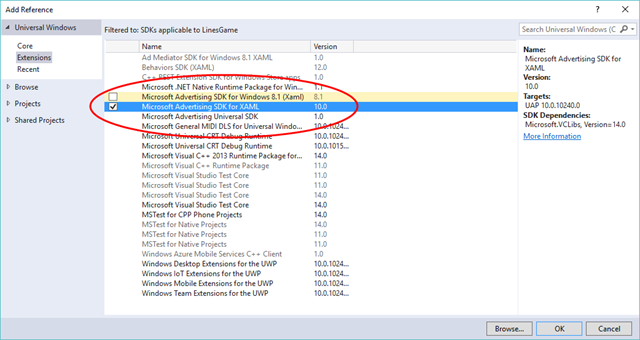 All the graphic controls, including the main windows, application bar (main menu), dialogs, message boxes and advertising are written using XAML and Windows-specific code. There are two main options in the Windows Store how to hide the app from public but make it available for specific users or beta testers: Package flights and Promotional codes. Below I briefly describe how I used Promotional codes with my app by the example of Lines 3D game. According to the Microsoft guide, in my submission on the Pricing and availability page in Distribution and visibility I chosen Hide this app and prevent acquisition. Customers with a promotional code can still download it on Windows 10 devices. Then I generated one promotional code and got so called “Redeemable URL” or the app activation link in other words.